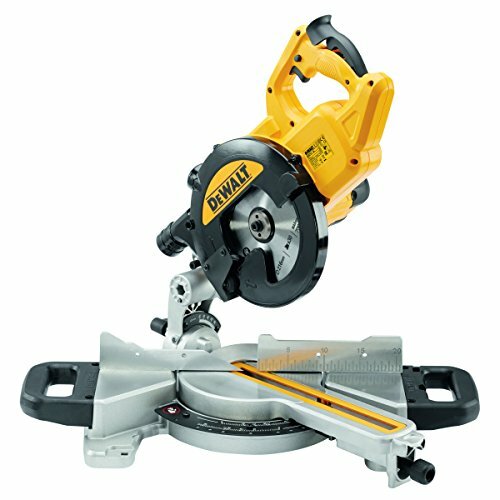 This has to be one of my favourite mitre saws we have looked at in a long time. It’s designed to be easy to use and tough at the same time, and it is. For a jobbing carpenter that needs to move around a lot or anyone that does not have a power source to rely on this is perfect. The Dewalt DCS365N looks brilliant, you can tell from a quick glance that it is Dewalt from the yellow handle and the chunky build. The attention to detail really shows on things like the blade cover which adds to the over all look. When you buy a Dewalt power tool it is for the ability to do a great job but a nice bit of styling always helps. 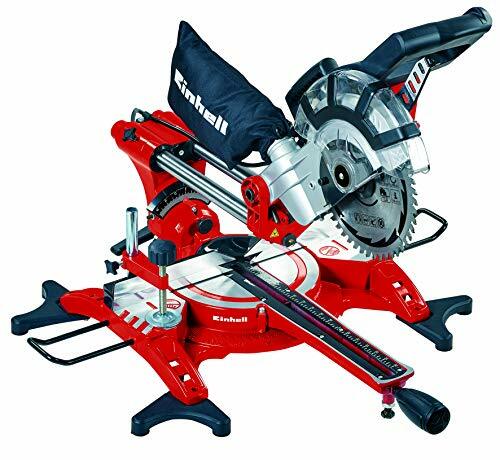 Cordless power tools are becoming more and more popular, having a cordless mitre saw makes life a lot easier. Often you need to set them up near a plug and end up walking to and from the area you are working in. Not with this model. If you have other Dewalt cordless power tools then this is a great buy as you will be able to inter change the batteries. If you run out of charge and you have the drill battery with you they can be swapped over. Saying that, the DCS365N boasts around 250 cuts per charge (dependent on battery size), that’s quite a lot. One thing to note is that it does not come with batteries, you will need to purchase these separately unless you already have some. This needs to be factored intro the cost as it will be a necessary extra. It is compatible with the Dewalt XR Li-ion battery packs. The smaller 2ah batteries start at around £40 and can go up to over £100 for the more powerful 4ah batteries. 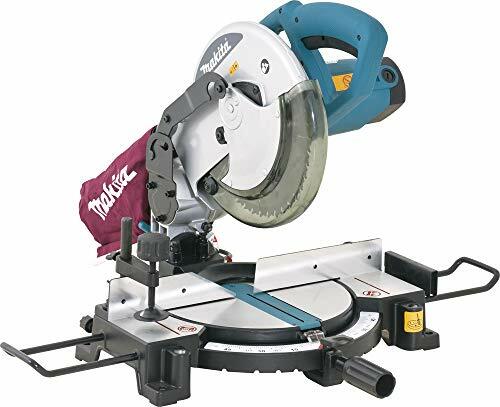 For the builders out there that need a chop saw this is a bonus as you can do away with cables and transformers and replace them with simple batteries which will save time as well as hassle plus it is a lot less kit to carry around. The shadow line system helps with brilliant accuracy and a much better system than any laser guides out there. For this alone it worth spending the extra money. Instead of having a laser guide there are LED lights that shine onto the blade casting a shadow on the cutting surface which will show you exactly where the cut will be. A brilliant system. To add to the cordless technology the easy carry handles are great. Situated at either end of the cutting deck all you need to do is lock the body down and pick up the saw and you are away to the next job. 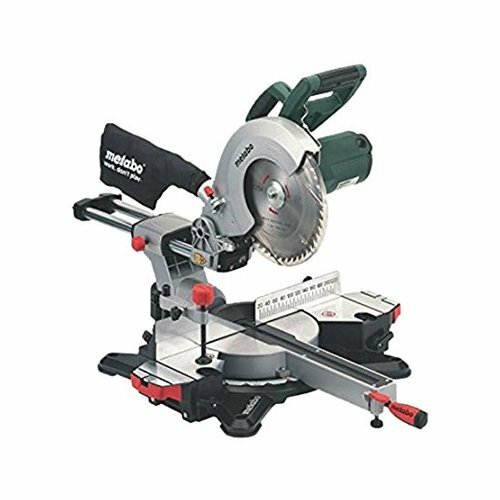 This is a light miter saw weighing in at around 9 kilos (19 pounds) compared to the evolution r210sms that comes in at around 11 kilos (24 pounds). When you are paying for portability this is another important factor and works well with the rest of the saws design. This is where the extra quality is noticeable over the cheaper models. The fan cooled motor offers plenty of power that can tackle tougher jobs then many cheaper saws especially when cutting materials like hard wood. The motor is also very quiet compared to some of the cheaper models out there. For longevity the motor brushes are replaceable, just drop it into a Dewalt service centre and it should be an easy job. 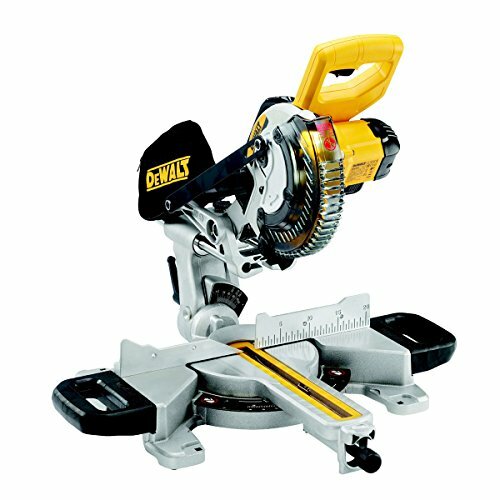 This is not a sliding mitre saw so will not cut the wider planks but it still is more than capable of some large cuts. The max capacity is 250 mm (10 inches) x 50 mm (2 inches). As the angles increase the cut size goes down to a minimum of 176 mm (7 inches) x 35 mm (1.3 inches). Check the sizes of the wood you need to cut before you buy. The build quality is second to none and very easy to use out of the box. Many of these comments are coming from tradesmen so are good authorities on power tools. The shadow line is very accurate and a huge upgrade to any laser system available even on the better models. 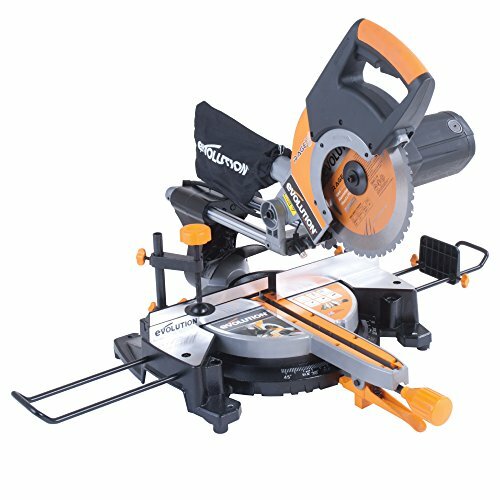 Many are pleasantly surprised at the power this saw outputs. The fan cooled motor means that the can work with some tough materials with ease. Portability is a big factor for many and the reviews reflect this. Lightweight and no wires or transformers are a big plus for many people. As much as I love this saw there are some key considerations to think about before recommending it. If you already have Dewalt Cordless tools and XR Li-ion batteries then it is an easy choice, we would very much recommend it. If you don’t have any cordless tools then you need to factor in the cost of the batteries and charger. This is going to make it a quite expensive saw. Also, check the rest of the Dewalt cordless power tool range, once you have chosen a cordless brand it can be very expensive to switch brands and defeats the object. If you have another brand of cordless tools then we wouldn’t recommend this model. It will mean you need two sets of batteries and chargers. In terms of quality you can’t really beat Dewalt and the DCS365N is no exception with fantastic accuracy, build quality and portability. A saw that deserves it’s high ratings.